We've found that the elastomer stacks can develop a bit of squeaking over time and that there's a simple fix. 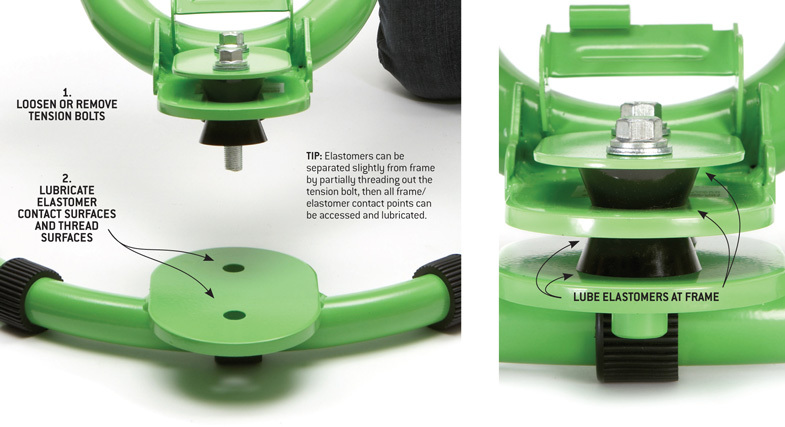 TIP: If you partially thread out the tension bolts, you can create a bit of space in the elastomers and the trainer frame, making it easier to get lubricant directly on the contact surfaces. Warning: We recommend using silicone-based grease. Do not use petroleum-based lubricants on the elastomer stack. Petroleum-based products will break down the polyurethane elastomers. I've added a generous amount of silicone based lube to the indicated surfaces and my rock and roll still squeaks. Would you recommend replacement rubber bushings? They are a few years old. How do I get the best calibration?